A concept drawing of an orbit and launch facility. In this historical photo from the U.S. space agency is a concept drawing of an orbit and launch facility. It was to use a nuclear SNAP-II nuclear power supply on the end of the long telescoping boom. 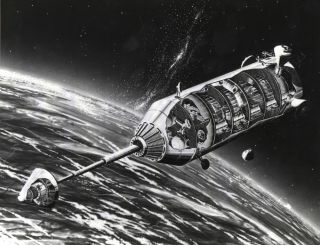 Nuclear reactors were considered dangerous, which is why in this concept drawing it was located so far away from the habitat part of the station. Creators envisioned the structure being built in orbit to allow assembly of the station in orbit which could be then larger than anything that could be launched from Earth. The two main modules were to be 33 feet in diameter and 40 feet in length. When combined the modules would create a four deck facility, 2 decks to be used for laboratory space and 2 decks for operations and living quarters. The facility also allowed for servicing and launch of a space vehicle. Though the station was designed to operate in micro- gravity, it would also have an artificial gravity capability.